On February 10, in the arena of Gimnasio Municipal «Jose Neri Santos» — Chihuahua, Mexico, a fight among the boxers in the second featherweight (Up to 58.9 kg) — Miguel Roman Mexico v. Aristide Perez Colombia. 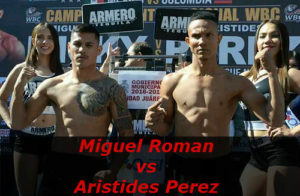 Miguel Roman vs Aristides Perez. The percentage of early wins Miguel Roman KOs 64%. The percentage of early victories Aristide Perez KOs 40%. The fight for the title of champion on the version of WBC FECARBOX. Miguel Roman is a Mexican super featherweight boxer. Aristides Pérez Torres is a professional Colombian boxer in the Lightweight division and is the former Colombian National Featherweight champion. Win for Miguel Roman KO4. Won WBC FECARBOX title.